services provided by Jo or Port Righ. Drawing on her Scottish heritage and on her experiences from several trips to the British Isles, Jo Morrison paints a vivid image of Celticdom through her performances. Using exciting, upbeat dance tunes and evocative, emotional airs, Jo touches the souls of her audiences. Described by music critic Pamela Murray Winters as having "the freshness and grace that first gave Celtic music its power," Jo has the energy and enthusiasm to invigorate any audience. Click here for samples of her music; click here for Jo's bio. Jo also performs with Port Righ. 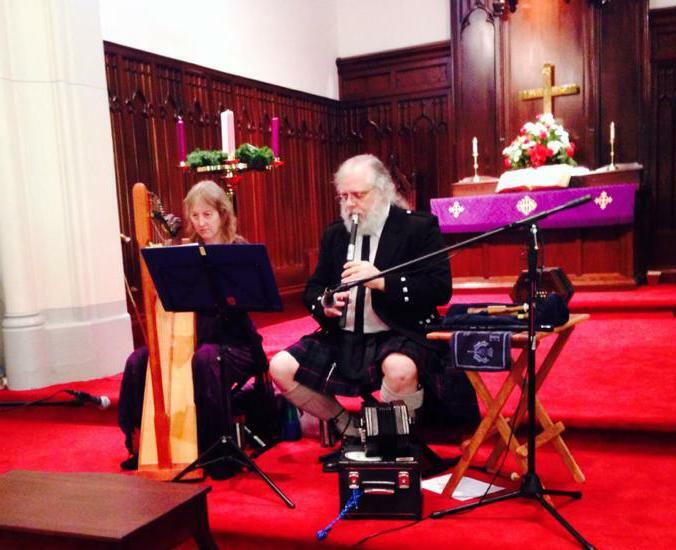 Featuring Celtic harp, bagpipes, vocals, and concertina, the distinctive duo Port Righ passionately shares traditional Celtic music with audiences. They specialize in Scottish music and have spent a great deal of time in Scotland absorbing the sights, sounds, and nuances of the culture, lending authenticity to their unique sound. 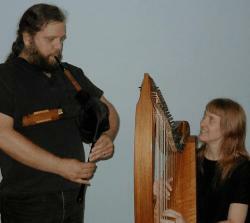 Jo has performed concerts at locations such as the An Lanntair (Stornoway, Scotland), Library of Congress, Somerset Harp Festival, the Smithsonian, a concert tour of Norway, the Maryland Renaissance Festival, various Scottish Festivals around the United States and also in Scotland, Ireland, and Germany. Jo's most recent recording is Flights of Fantasy. This is an all-original recording filled with music inspired by family, dear friends, Scotland, the Northern Lights, mountains, waterfalls, and dancing bison. This recording features Celtic harp, but also includes electric harp, and piano. There are also three tracks with Port Righ, where the harp is joined with concertina and shuttle pipes. Jo has five nationally available recordings, The Three Musics, A Waulking Tour of Scotland, Christmas Gifts, By Request, and Flights of Fantasy, all available through mail order here. Jo's recordings are available through Melody's Traditional Music, Sylvia Woods Harp Center, CD Baby, and Amazon.com. Jo has also recorded a CD with her duo, Port Righ: Na Bi Gòrach. All of these recordings are available online through the magic of digital distribution. Several complete tracks from The Three Musics are now available. See that album's page for MP3 links. The Washington Area Folk Harp Society's live recording of their 2000 Benefit Concert, The Song of the Selkie, is also available for sale. This recording features a new folk tale as told by Scottish story Heather Yule, and performances by sixteen harpers from the society. "... [This CD] is a way to return to that childhood sense of wonder and delight over something seemingly magical..."
Jo is available for any type of event, including weddings, funerals, corporate parties, anniversaries, and private functions. 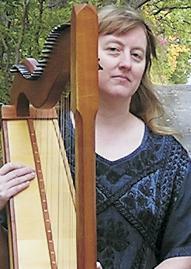 She gives scholarly lectures on the history, folklore, and music of the Celtic harp. She also gives Celtic harp lessons both privately and at workshops. For bookings, you may contact her at harp@triharpskel.com or 410-875-0855. This web page is Copyright ©2013 by Jo Morrison. All rights reserved. "Triharpskel" and "Triharpskel Productions" are trademarks of Jo Morrison.